One might ask why it would benefit you to shift your focus away from novel writing to short story writing. The number one reason is marketing. This is one more way to promote your novels and brand, while honing your craft and learning to write succinctly. Sure, you can continue to write blog posts and articles in magazines and sources read by other writers, but stories are another way to reach your fans. Not only that, but you can make money and win contests doing so. Come to this workshop to find out what markets are out there, what magazines and anthologies are looking for, and how to find them. Learn how to sell short fiction, where to find markets, what you need to include in a cover letter for short stories and more. 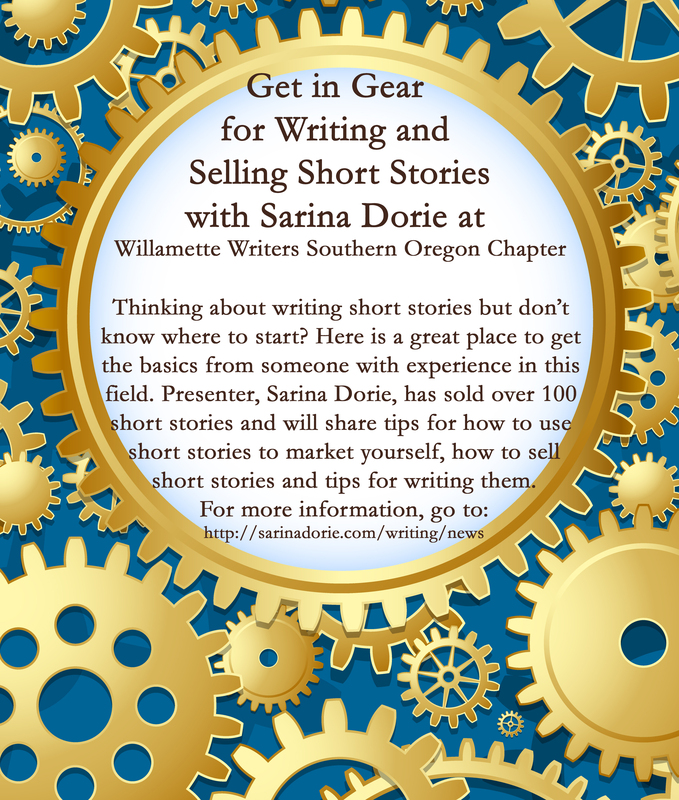 Presenter, Sarina Dorie, shares her experiences with you after selling over a hundred short stories to magazines and anthologies. How does one know what a market wants? What makes a short story sellable and how does write a story that will sell? Come to this fast paced workshop to find out. We will practice dissecting markets and magazines so you know how to find the right ones for you. Bring a pencil and paper or laptop to experiment with short story techniques. Sarina Dorie has sold over 100 short stories to magazines and anthologies in the last six years and has several novels published as well. She will share the secrets to her success so that you can write short stories and make money selling them. Sarina Dorie has over 100 short stories published in the genres of fantasy, sci-fi, romance, humor, and non-fiction, has won numerous awards and has several published novels. Sarina has worked as an English, art and dance teacher, a copy editor at an advertising agency, and a writer. She joined her first critique group when she was sixteen, and has given workshops at theWillamette Writers, Romance Writers of America, Wordcrafters and various science fiction conventions like Worldcon and Gearcon.